Victorian Captain: 1879 The first colony-state captain. Gardiner was a Carlton footballer, Captain and President, state Parliamentarian and Alderman. If that wasn't enough, he also fathered future Blues Jack and Vin! Gardiner is listed as the Captain of Carlton in 1879, also doubling in that year as the Captain of Victoria. His life story is outlined in an article by Tony De Bolfo, kindly released by the Club to the Blueseum, and available here. 1872 Laid the foundation of his frame on the field. He began as a rover and centre, and afterwards proved himself an active and reliable back. 1873 An efficient lieutenant in 1873. 1875 John Gardiner. Carlton vice-captain. A splendid runner with the ball, dodges and kicks well, his style much admired. 1876 (Captain) An active and reliable back, makes pretty and effective runs, is very sure since he limited them; a painstaking and energetic captain. 1878 Played in both Carlton-Waratah Rugby and Australian Football exhibition games, June 29 and July 1 at the M.C.G. J. Gardiner scored 4 goals for the season 1878. 1879 As Captain, still boasts a reputation for good generalship. As a player, has shone out at times brilliantly - especially as a "dribbler." Is seen to best advantage when placed as a centre player. 1879 One of the mainstays of the team, captain, and also captain of the Victorian team that played against South Australia. Prior to playing South Australia in the first intercolonial/interstate match. Members of the Victorian team met and unanimously elected John Gardiner as the very first captain of a Victorian team. Retired at the end of the 1879 season. The Carlton electorate was divided between Mr. Munro and John Gardiner. The older generation opting for Munro and the younger native born electors prefering one of their own. "Carlton is already like a country in a state of civil war; fathers everywhere canvassing for Munro, and sons neutralsing the old men by bodly averring they will go straight for Gardiner." 1880 Elected to Parliament, April-May. "The only youngman is Mr. Gardiner, and to him the eyes of the ladies in the gallery are turned". ".....no objection to a footballer coming into Parliament, it might be as well for the individual, and it certainly would be better for the House, if the slang of the arena was not introduced also"
"However, Mr. Gardiner has assured the public he is reading up. And the library contains George Eliot's excellent little essay on slang, entitled Debasing the Currency." "He (Jack Gardiner) was the first Victorian native born elected to Parliament in that State." In several important constituencies the "Australian native" vote has carried off the honors of the day, in Carlton, where Mr. John Gardiner, has beaten Mr. Latham an opulent brewer, the liberality of whose character only stops short of ostentation, and who is an earnest, well-educated, capable man of the world; and his young competitor is, in truth, nothing more than a fine manly-looking fellow, a champion football player, "Our Jack" of the Carlton Club, and captain of the team." The Boot On The Other Foot. "Our Jack" is eternally boasting about having made the Carlton Football Club what it is - and to do that "modest estimable young man" (Quot: Murray Smith) justice, he appears to be proud of his handi - or rather footy-work. Now, as a matter of fact, the opposite is the truth. The Carlton Football Club has made Jack what he is, as it were - and strange to say the club is not proud of it's legislative creation." "Why? Mr. Gardiner, the footballer, was taken, "reeking hot" from the ground in Carlton the other day, and thrust into parliament, over the head of Mr. Munro, for no other justly assignable reason, than that he was a good athlete. Not only so, but we have heard of wagers being offered that if Ned Kelly escaped hanging, and came forth as a candidate for Collingwood, that he would have been put in over the heads of Messrs. Langridge and Mirams on account of his expert and bloody handling of the revolver." 1881 Ex Carlton captain and was a central umpire in the first match against Hotham (now North Melbourne) and represented the Carlton electorate in the Legislative Assembly. Carlton played Hotham on Princes Oval. Some players had not turned up and the Blues were a few players short. A call went out to the crowd for volunteers and John Gardiner donned the football gear and played. Unfortunately he broke a finger shortly after the start of the match which Carlton won, 3-1. "Mr. J. Gardiner, MLA, acted as central umpire, and was got up for the occasion in a striking if not picturesque costume, consisting of black trousers and hat, and an upper garment closely resembling a white shirt worn loose." This was at a South Melbourne and Hotham match on the M.C.G. by John Gardiner, Esq, M.L.A. The Gippsland Times published a speech made in the Victorian Parliament which mentions J. Gardiner. There were rumours of players misbehaving on the visit. Two players were found guilty, and the club decided to leave them out of the team for the remainder of the season. Nine out of the first twenty players handed in their resignations. Carlton were to play Essendon at Princes Oval, and a team built of reserves, juniors, and Mr. Jack Gardiner M.L.A. stripped for his old club. This "scratch" team rose to the occasion and defeated Essendon 3.13 to 1.10. The Argus published an item about Jack Gardiner MLA. J. Gardiner, late member for Carlton in the Legislative Assembly has been banquetted and presented with a purse of sovereigns. The Corowa Free Press (p6) carries a report from Melbourne which includes stories about two Carlton identities, former captain Jack Gardiner and vice president William Ievers. "I am forcibly reminded by the turn that things have taken of late of how sorely explusion from Parliament has fallen on some ex members. The hard times have touched everyone. Our friend Jack Gardiner, "the member for football," as you, Punch used to dub him in the gay old times, is working in the Railways Department as a ganger for 7s 6d a day. Jack once had a prosperous jeweller's shop in Carlton. Later, he had a flourishing auction and real estate business. His fall is great; but it is no stigma on him. All honor, I say, to the man who can face hard times as Jack is doing." The Perth newspaper, The Inquirer and Commercial News published a letter to the editor from "Observer" about Jack Gardiner. "Jack Gardiner, the old time captain of the Carlton Football Club, was elected councillor for the Victoria Ward in the Melbourne City Council. His opponent took his gruel in bad taste, stating his defeat was owing to the Labour and Roman Catholic cliques. Jack remarked in his experience he had often been beaten, but took it kindly, for he found time and patience served a man best in the long run. 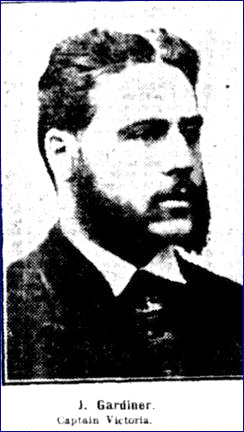 Gardiner has had a most varied experience, by trade a working jeweller, then put into Parliament by the footballers to represent Carlton, which seat he held for many years; then defeated, disappearing from public view whilst battling for an honest existence, and now he bobs up serenly as an estate agent and a Melbourne councillor. He was ever a rough diamond, but his honesty has always been unimpeachable, consequently in the political world he cannot be expected to shine." The Argus' football journalist "Observer" writes about the forthcoming old timers match on the M.C.G. He writes about some of the former players taking part in the three matches. "Obsever" talks about Jack Gardiner and Jack Baker. 1924 Alderman John Gardiner captained an old players team at the M.C.G. on September 26. The opposing captain was former Carlton champion Jack Baker The Blue team wore Carlton guernseys and the White team wore the Geelong colours. John was nearly 76 years old. In the Argus preview it said; "It is an extraordinary coincidence that today will be the fiftieth anniversary of Alderman Gardiner's wedding. On September 26, 1874, he was playing for Carlton v Geelong in the afternoon and was married in the evening. There are not many athletes who can celebrate their golden wedding as Alderman Gardiner is doing." There are three, possibly four former Carlton players pictured here. Jack Baker and John/Jack Gardiner former Carlton captains shaking hands, and above, on the left, is William 'Billy' Hannaysee who went to Port Melbourne and became their first captain, and, far right, possibly J. Muir who crossed to Fitzroy when that club was formed. The photo on the right is a portrait of John (Jack) Gardiner in his younger days. 1929 - Three Carlton captains - a president, vice president, and a long serving hon-sec of the VFA. One of the last photos of Jack Gardiner, he died 9 months later. John Gardiner collapsed and died at 7.30am at his home at 166 Rathdowne St. North Carlton. His funeral procession left from his residence on Wednesday October 30 for the Melbourne General Cemetery. He passed away six days short of his 81st. birthday. "Sportsmen of the older generation especially will regret the news of the death of Alderman John Gardiner, who was captain of the Victorian team which played in the first intercolonial match against South Australia. He was captain of the Carlton Football Club, and was known as a fast, clever player. He played in the days of Robert and George Robertsons, George Coulthard, "Paddy" Gunn, "Billy" Dedman, Jack Donovan, and Harry Nudd. His popularity was so great that when in 1880 he was nominated for the Carlton seat in the Legislative Assembly against Mr. James Munro, he was elected. 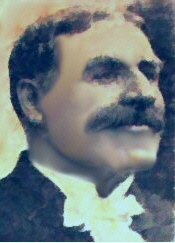 The idea of the captain of a football team being able to defeat an experienced politician like Mr. Munro caused a sensation. He represented Carlton in Parliament for many years, and had been in the City Council for 25 years. He had been the alderman for the Victoria Ward since 1915. Alderman Gardiner was president of the Carlton Football Club for many years, and sat as its delegate on the League. When five years ago an old players' match was played for the Lord Mayor's Fund, although aged more than 75 years, he took the field as captain of the veterans." To play that game, Futball. I challenged one and all. All through that game, Futball. And makes a tidy haul. Contributors to this page: blueycarlton , johnnyjames10 , pblue , molsey and Jarusa . Page last modified on Monday 16 of April, 2018 20:47:55 AEST by blueycarlton. 1985 - Bugsy Comben Big V story (09/05/85). 2000 - Most Improved Award: Anthony Franchina (Again).